It was recently reported that nearly 1/3 of Americans — 84.5 million people older than 13 — owned smartphones in August (Comscore). What’s more, 43% of online adults told Google and Ipsos that they’d give up their favorite adult beverage for a month in exchange for internet access via smartphone. They most often use their internet-connected devices at home, according to the Google-Ipsos study conducted in April 2011. Want to see more. 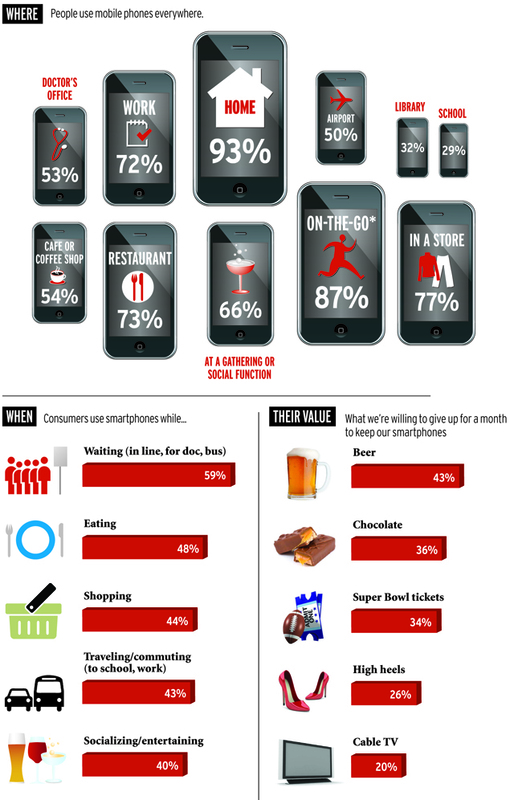 Check out the info graphic below.This helps us understand why mobile advertising works. Based on 5013 smartphone users. Source: The Mobile Movement Study, Google/Ipsos.